Anyone want to go out for a burrito? DR: HERE IS YOUR REMITTANCE ADVICE. BY MY CALCULATIONS, YOU MAY NOW AFFORD 1.237 BURRITOS. HAVE A NICE DAY. So this week feels like Christmas, like winning the lottery. 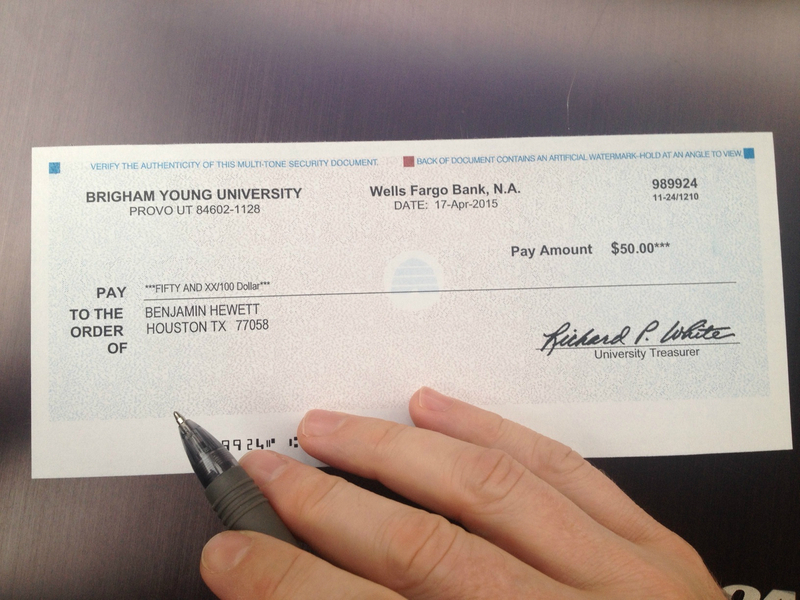 And here’s the thunder: today I received a $50 check for an anecdote published in the spring 2015 issue of BYU Magazine. I wonder how many burritos I could get for that? Needless to say, I probably need to rethink my pricing structure. While I’m doing that, feel free to subscribe, follow, or look at books. Here’s some fun news: my first book is out on Wednesday in French, for those of you that missed the English version or think I might be funnier in a foreign language. . .
I’m in the process of putting my greatest work—a science fiction novel I’m not allowed to name yet—through an excruciating rewrite. One of my assignments is to trace through my own story and identify the crucial turning points. Matt: You know, in print, this would be like 700 pages, right? Me: Err. Is that bad? Mentor Mike: Ben, you need to have a cool villain in book one. Me: (Cowering) There are plenty of cool villains in book one. Mentor Mike: You know what I mean. THE cool villain. The one that you’re saving for later. So now it’s down to brass tacks and agonizing over the anatomy of the different types of conflict. This is painful. I outline the entire first novel—something I’ve never done before—but that still doesn’t articulate the plot. It’s 8:30 PM and everyone else has gone home to dinners and enjoyable pursuits, while I’m left staring at a computer screen. Again. In desperation, I tell myself I won’t leave my desk until I’ve completed this homework: define your crucial plot points. I’ll eat my entire store of applesauce packets if that’s what it takes to keep me going. I start with a line, the protagonist’s static trajectory. I read my outline and add a new point, a nudge, something that changes him. From there I draw a new line, guessing where he’ll end up if he isn’t disturbed again. But there’s a whole ‘lotta torture coming. I add a new point and a new line. More points. More lines. 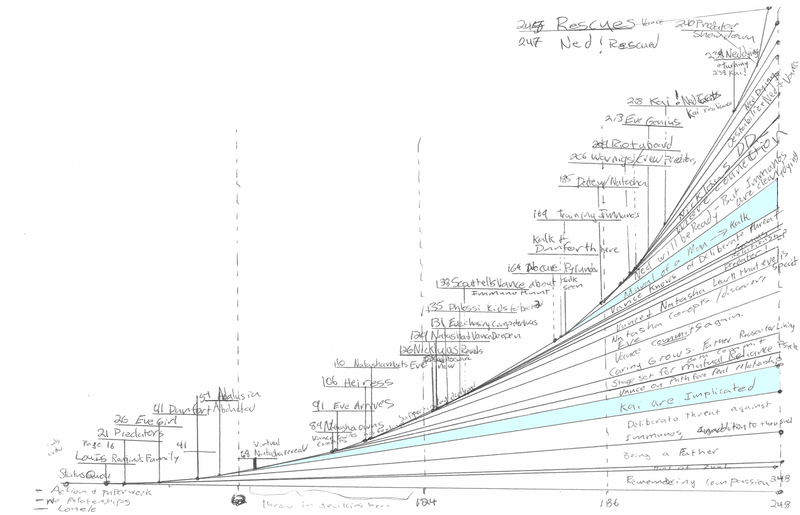 What I end up with is this: a pile of inflection points, moments after which the protagonist will never be the same. These points carry him step-by-step away from the safe, boring harbor he’d imagined for himself and into the wild unknown. My main character faces decisions not unlike our own. For instance, we decide to become parents without knowing how it will turn out. We leave a comfortable employer for a better opportunity. We hitchhike cross-country for summer work and realize that home will never look the same because of the new perspective we’ve earned. These moments are our own inflection points, permanent alterations in the course of our lives. My challenge to you this week: do something you’ve never done before (preferably something ethical), and capture that moment in a private journal. If you’d like to share it, feel free to leave a comment. I read every one. Thank you. Thank you all! I am both humbled and elated! I’d like to thank my publisher for letting me post my fiction without the least bit of professional editing, my beta readers (all twenty of you—you know who you are), and my mother, who has always told me I’m worth something, and been slightly supportive of my cheeky attitude, except when directed at her. Those last two commas are driving me crazy. Where are the grammar police when you need them? Is my critic somehow saying that DARTS was not enough for him? That he wanted it to be longer? Did they mean it would be easier to classify, by genre, on a rainy day, when life is less hectic? Or should I take this as a compliment? Houston receives about 50 inches of rain in an average year (NOAA.GOV). That’s a lot of opportunities for appreciating my novella! What I would have liked from said detractor: a clear indication of what will make my stories better in the future. Lacking that, I can only hope to untangle the riddle with time. Perhaps one of my alert readers—long live Dave Barry—can help clarify. I’m not bothering to fact check that. It would be more accurate to say he cranks out several huge books a year. And while they vary in subject and tone, the books are all unique, with driving plot lines and interesting twists. When juggernaut fantasy novelist Robert Jordan passed away, Mr. Sanderson was selected to finish off the Wheel of Time series. He added three enormous volumes, each a worthy anchor for one of Her Majesty’s Ships, even though the original contract was for only one book: A Memory of Light. 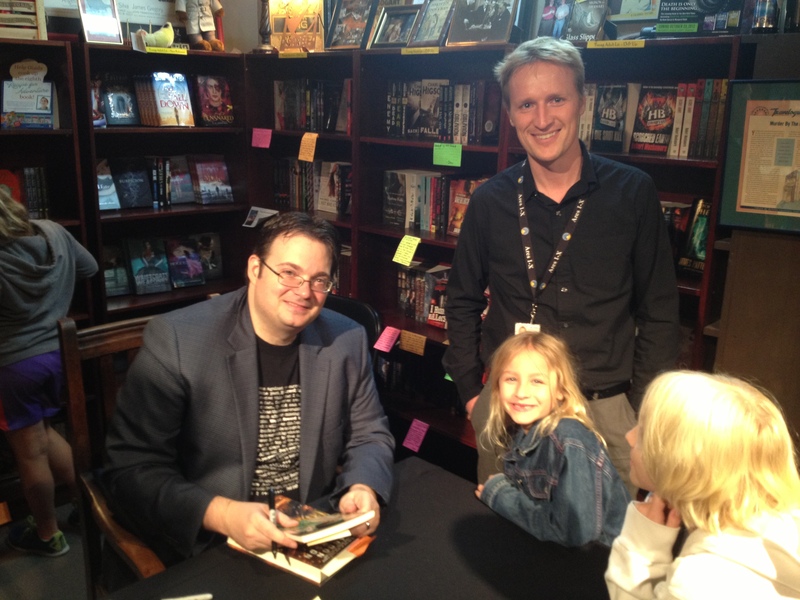 He has two Hugo Awards under his belt (one shared), and he’s very very entertaining to listen to. He even wrote a short middle-grade series for kids (and immature adults) about a family whose lineage are all named after famous prisons. I do remember Brandon’s essays from that period, written while he was editor of the same magazine mentioned above, because I quoted them repeatedly as an undergrad in papers for the excitingly-titled “Writing for Publication” class. So, the night before the signing, I did what any fan-boy might do: I crawled into the attic and dug out an old copy of the LEADING EDGE, and when the book signing started, I plopped it down on his table. He looked at it in grand surprise and then turned deftly to the page where his name was, signing enthusiastically. Brandon’s lecture at the signing did not disappoint, and my kids came away with loads of loot, as they had asked interesting questions and helped him pass out prizes to the other attendees. Brandon was very kind. Maybe one day he’ll be my friend on Twitter, or endorse one of my books, or post on my Facebook page. Or maybe I will always be that annoying fan-boy who should have spent more time reading slush-pile. Ha! No matter! The tile in the small hotel room is always warm when my feet shuffle in, tired from a day of hiking in the city, or still sleepy from staying up too late working on my pitch for Immuno. This is the thing I love most about my hotel room. The ground is warm and it reminds me of Texas sun on winter carpet. The glass shower partition makes it hard to reach the shower controls without climbing all the way in (clothes on), and that first cold blast of water is hungry to surprise me. It doesn’t give me much time to duck back behind the glass wall, but thirty-five is still young . . . As long as I don’t slip. When the water steams, I close my tired eyes and crawl in to wake up, or warm up, depending if I’m coming or going. At lunch, I tell my new friend Matt that he’ll sleep better if he wears earplugs at night, and he laughs over his tacos. 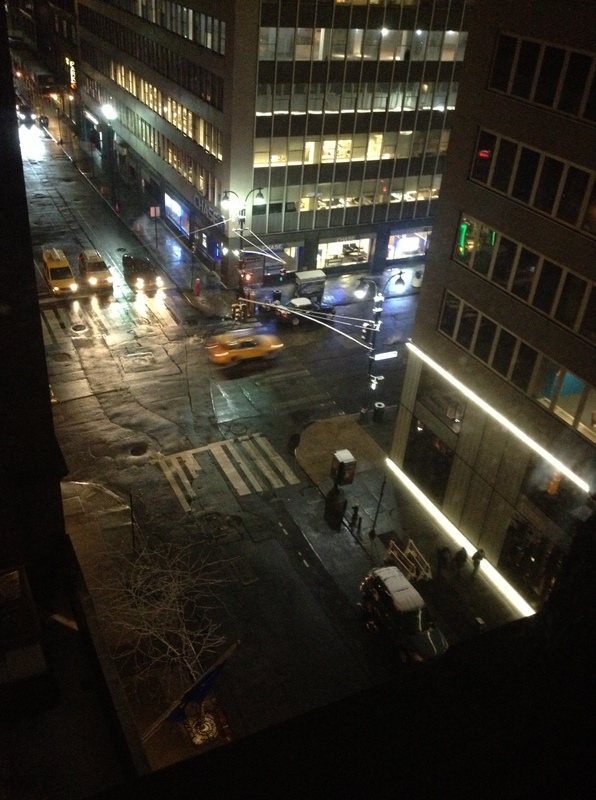 We’re eating right next to Penn Station, taking in the March snow and the crazy crowds. I love walking through the city and hearing all the voices, throats from another world, raucous and loud, quiet and timid, rolling out on the near-frozen air in ways that I’m not accustomed to. Of course I’m going to a show. I’ll do conference homework ‘til three in the morning if I need to, but I’m establishing tradition now: Broadway Musical or die. . . Somehow I find myself buried in a crowd of Japanese adolescents, old enough to be out on their own, but not old enough to have given up the flock of familiar peers, laughing, looking, and waiting while the best English speaker in their group tries to negotiate for twenty tickets to the Lion King, which has already been sold out. Bummer. That’s the show I wanted to see. My own English skills, though far from flawless, allow me to make peace with the Gods of the Inevitable and accept my fate. I don’t blame anyone, not even myself. Tonight might have found me dining with the other pitch conference attendees—which I still managed to do—or working on my next book. Whichever. I love the voices and personalities: Ralph. Rachel. Jason. Nina. Clarissa. Erik. Jessica. Sami. And the strangers. English. Irish. Mexican. French. Japanese. American. I talk with them all, sometimes with just my eyes. Actually, it sounds more like this: “You want come Japan? You stay. My email.” Hidenobu gestures for a pen. It’s amazing what you can discover about a person during a 30-minute wait for the show to start, what moments you can share. The French voices are easier to understand than the Japanese, Russian, and Italian ones, but it’s a stretch say something at first. What if my French is bad? (I know for a fact that it’s worse than my English.) But Mathieu and Julien are amazed that someone in the United States can carry a conversation, which might have lasted longer, but I have to go to bed and actually sleep. I do have time to warn them about being at the booth in Times Square two days in advance for Lion King tickets. They’re surprised to hear this. I’m not surprised. They’re guys, and they think like me apparently, and will eventually wind up smashed between a pile of Japanese adolescents that are too old for parental. . . Oh wait. I already said that. This is my humor. The cold air makes me cough, and the snow stings my throat. There is slush on the asphalt and clouds of hot breath and cooking smoke in the air. Roasted cashews. Can you smell them? The TV lights in Times Square flash bright enough to make daylight and I can still hear the Irish lady in the adjacent seat singing the Phantom of the Opera even though I’m on my way home. My earplugs are waiting on the bed stand, plotting to sleep me through my alarm tomorrow so I set three, just in case, and crawl into the bed. Or the shower. And yes. New York wants the manuscript!